What is a post and frame building? Post and frame or post-frame buildings are structures constructed entirely from a wooden framing system, as opposed to the standard steel and masonry. The building is anchored by enormous solid-wood posts or wood-laminated columns that are either embedded into a concrete or masonry foundation or placed directly down into the ground for appropriate load transfer. The rest of the building’s frame is constructed from interlocking wooden pieces. 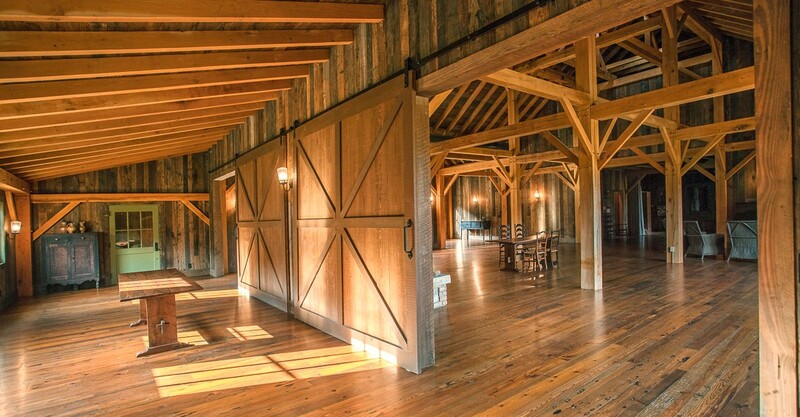 The building’s strong posts and wooden framing elements work together to create a structure that is significantly stronger than stud-wall construction. Plus, because post and frame buildings rely primarily on this interlocking wooden structure for strength, they require a limited amount of materials and can be constructed fairly quickly. This saves both time and money on the project. Examples of post and frame buildings are everywhere, from spacious rustic ski lodges to residential homes and storage facilities. The sturdy construction of a post and frame building provides the strength required to support unusual architecture like tall or open walls. Because the overall “skeleton” of such a building is so simplistic, almost any desired facade can be placed on its frame. Once a post and frame building has been fully constructed and the facade has been completed, construction can turn to a focus on the indoors. As in any business, industrial building, or home, one of the key aspects of completing the interior is the addition of appropriate doors. Depending on the size of the building and the primary uses for each of its rooms, there can be a wide variety of door types, sizes, materials, and visual styles. Builders can install lightweight commercial swing doors on interior rooms, but many are now turning to more alternative styles of design such as sliding barn doors and track for room dividers, closets, and bathrooms, or heavy duty strap hinges on uniquely crafted and heavy wooden swinging doors. Specialty door hardware can bring a variety of design looks: rustic, industrial, or an elegant, vintage touch to any interior. Below is an outline of different aspects of specialty door hardware for swinging and sliding doors in post and frame construction buildings. 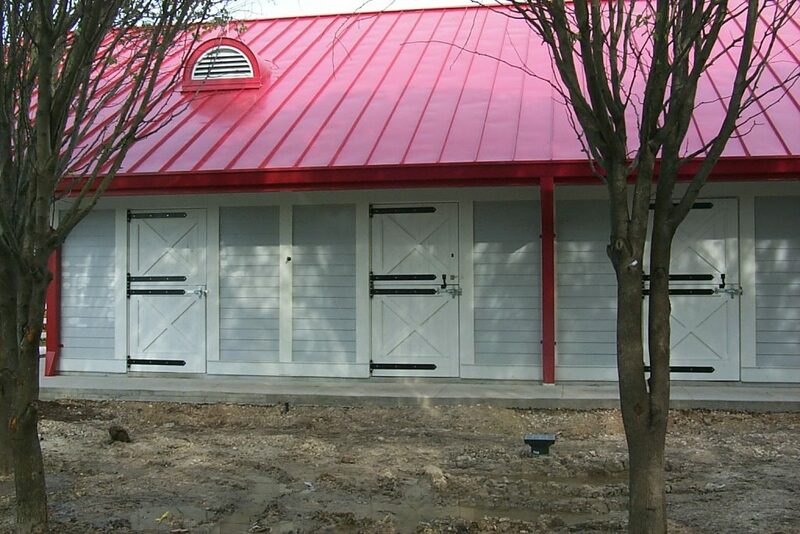 are specialty swinging barn door hinges made from thick-gauge steel for improved strength and higher weight capacity. These hinges are available in a variety of thicknesses and can be used with doors from 400-5,000 lbs. in weight. 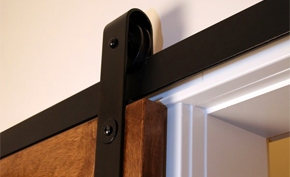 Center strap hinges are used for slide-fold doors. Just as the name implies, the hinge on this particular kind of strap is located at the center of the piece, with each side attached to a door panel. are typically used to bolt strap hinges to non-reinforced doors in an effort to distribute fastener force over a larger surface area. As a result of this broader distribution of force, hinges are capable of supporting more weight than they otherwise would be. Back plates are typically manufactured in the same standard lengths as the strap hinges: 18-in, 20-in, 24-in, 30-in and 36-in. are available in a variety of styles that emulate various types of hardware throughout history. For example, RW Hardware offers beautiful arrowhead-shaped strap hinges ideal for a rustic, vintage barn door look. Enclosed track hardware was first introduced to improve sliding door safety by reducing the likelihood of the trolleys jumping the track and, therefore, dropping the attached doors. Today, enclosed box track hardware is an extremely common choice. Flat track (or barn door track) hardware predates enclosed track hardware, having been used for decades with barn doors and similar openings. Today, flat track hardware is much improved and is often selected for its decorative value. The amount of weight a track system is able to support differs based on its construction. Heavy-duty: up to 5,000 lbs. Flat track systems can support between 400 and 800 lbs. Examples of sliding track hardware styles from RW Hardware include Arrowhead, Traditional (rectangular), and Top Mount (no visible hanger from a front perspective). RW Hardware specialty sliding door hardware is available in eight different powder coat The finish you select for a project can make a significant difference to the final visual appeal of the door. Black hardware stands out on lighter door finishes for a strong contrast effect, while oil-rubbed bronze creates an antiqued vintage look. One of the unique things about door hardware is that its appearance can be customized to meet the stylistic preferences of any business or home owner. Because post and frame construction makes it possible to have taller walls and more sprawling floor plans, it can be difficult to find the appropriate hardware to accommodate the larger, heavier doors required by certain buildings such as in this restaurant above. In these cases, the thicker gauge of steel used in specialty door hardware can be sufficient to support these significant load increases. At Richards-Wilcox Hardware, our professional staff is dedicated to providing you (and your clients, if you’re a contractor) with everything you need to create functional and beautiful doorways throughout your project. 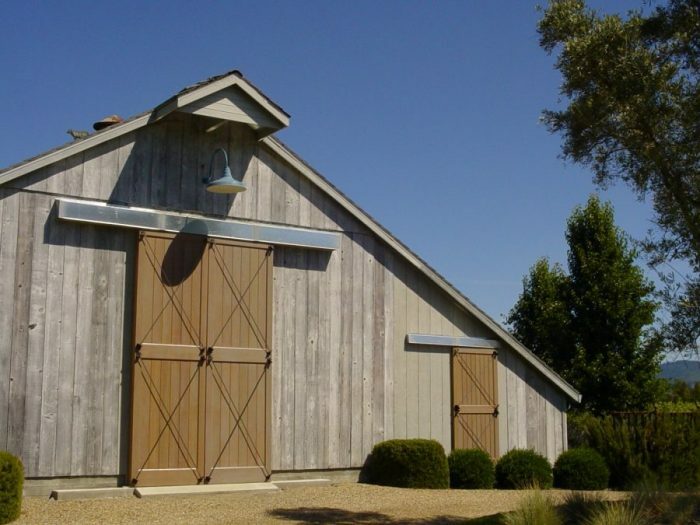 Whether you are seeking an architecturally accurate set of specialty hardware for a post and frame building to imitate the look of a traditional or historic building, or looking to install industrial weight doors in a commercial property. Richards-Wilcox Hardware has the high-quality door hardware necessary to get the job done right. All of our specialty hardware is constructed from strong, top-quality materials finished with a smooth powder coat. Our industrial-strength hardware is able to support doors that are heavier and/or larger than usual. Plus, our unique specialty hardware designs are perfect for clients working on post-frame projects trying to duplicate the look of traditional historic projects.